Who tried to hustle the East. The mixture of official documents and poetry in these wallets intrigues us in part because, while the documents would appear to enforce or at least prioritize a standardized, bureaucratic life narrative—birth, marriage, enlistment, discharge from the army, etc.—the poems don't signify as clearly, and they thus testify to aspects of a lived life that are not reducible to paperwork. That is, they add an element of subjectivity or opaqueness to an otherwise objectified or transparently-recorded human existence. It may be impossible to determine exactly why each person included the poems he did—why did Ralph Edmond Baxter (portfolio pictured here) include the newspaper clippings of James Metcalfe's "Portraits" from the Chicago Times (a form of rhyming prose poem called a poemulation in Sinclair Lewis's 1922 novel Babbitt) along with his "separation from military service" and incomplete application for membership in the Illinois American Legion, for example?—but the juxtaposition of official and poetic discourses suggests each person's impulse to complicate or augment the bureaucratic structures that reduce their lives to dates, forms, and numbers. 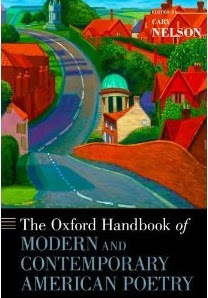 In the recently published Oxford Handbook of Modern and Contemporary American Poetry (2012) edited by University of Illinois poetry scholar and current AAUP President Cary Nelson, P&PC got a chance to ruminate on this topic and other relevant issues in greater length, beginning with a portfolio kept by Paul Fox (1893-1943), a World War I veteran, farmer, and "gas man" for the Logan Gas Company from Ohio. In addition to his military discharge papers, his social security card, marriage license, and insurance paperwork, Fox kept a copy of an anti-FDR poem "Rejected," a piece of political satire in which FDR dies and goes to hell, only to be refused admission by the devil. (That's the poem on top of the paperwork in the picture here; a higher-resolution image can be found below.) What keeping this poem might have meant for Fox, how "Rejected" became one of the most widely circulated poems of the 20th century (teaser: it even featured in Nazi propaganda), and what the saving of poems more generally offered to American readers, is the topic of P&PC's contribution to the Handbook, "Material Concerns: Incidental Poetry, Popular Culture, and Ordinary Readers in Modern America." Paul Erwin Fox was born on November 21, 1893, in Ohio's Vermillion township, which is now about a forty-five minute drive from the city of Ashland in the north-central part of the state. Except for two years' military service during World War I (he enlisted in the army on September 23, 1917, participated in the first allied offensive victory of the war at the Second Battle of the Marne, and was discharged on August 9, 1919), Fox lived his entire life in Ashland County, first working as a farmer near the village of Sullivan and then as a "gas man" for the Logan Gas Company and the Ohio Fuel Gas Company. With the Rev. T.T. Buell of the Methodist Episcopal Church of nearby Newark presiding, he married Mary Kathryn McManamay on September 14, 1920, and the pair eventually had one son, Donald. Fox had life insurance through the All American Life and Casualty Company of Park Ridge, Illinois, attended the Dickey Church of the Brethren, and was a member of the American Legion's Harry Higgins Post Number 88. He died on May 19, 1943, two days after suffering a stroke while working on a gas well near Medina and six months before reaching his fiftieth birthday. When Fox died, he left among his belongings a cluster of official documents stored inside a brown, wallet-sized portfolio originally issued with his discharge papers from the army. Those discharge papers, signed by Major H.B. Karkoff at Camp Sherman in Chillicothe, Ohio, are still intact: Fox's middle name is misspelled "Irvin." To these documents, Fox would later add his social security card, itself contained in a specially designed, chocolate-colored folder marked "Compliments of the Mansfield Typewriter Company" and dated December 12, 1936, making it one of the thirty million issued when the Social Security Board first began mass-registering people nationwide in late November of that year. And then he'd cap off this encapsulated record of his life by adding a poem that may well have been one of the most widely distributed poems of its time, but which few people remember today. We hope you enjoy the rest of the book!